Americans got an impromptu “Introduction to Canadian Politics” lesson courtesy of John Oliver Sunday night, when the late-night talk show host mocked our major party leaders and electoral system. Oliver devoted 15 minutes of his half-hour show to the Canadian election, beginning by skewering the notion that a 78-day-long election campaign was gruellingly long. “Thinking that 78 days is a long campaign is absolutely adorable,” he quipped. Oliver had some fun with some of the embarrassing candidate gaffes during the campaign – including the departure of one-time Conservative hopeful Jerry Bance over “peegate,” and NDP candidate Alex Johnstone, who had to apologize for her ignorance about Auschwitz. Online, CTV ELECTION 2015 will be live-streamed and available internationally on CTVNews.ca and on the CTV News GO app. But the popular comedian saved his sharpest barbs for Stephen Harper, mocking everything from the Conservative leader’s awkward Netflix ad, to his band "The Van Cats," to some of his Conservative government’s most controversial policies and legislation. 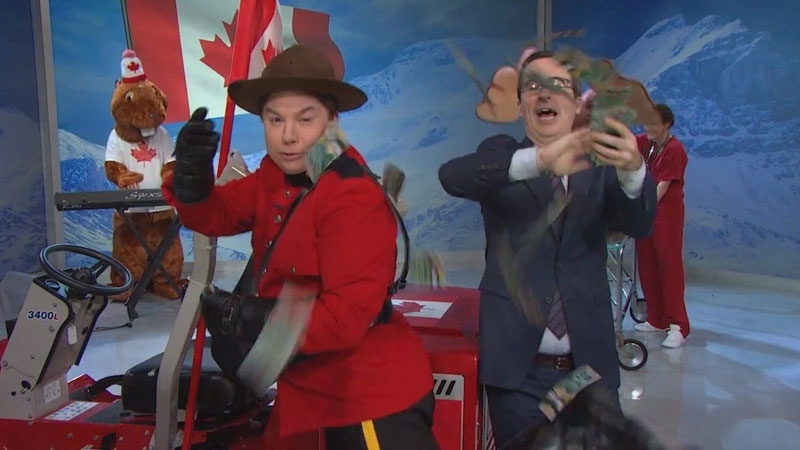 To wrap it all up, Oliver offered up a keyboard-playing beaver, a moose getting a colonoscopy under “Canada’s fantastic single-payer health care system,” and -- of course -- Canadian-born comedian Mike Myers dressed as a Mountie, driving a snowplow. The comedian said he was willing to infringe upon Canadian law, which bans foreigners from inducing Canadians to vote a certain way, as he told voters not to re-elect Harper, who he compared to a kindly neighbour’s bad boyfriend. “You think I’m scared of six months in a Canadian prison? What’s that -- six months of living in Ottawa? As for your $5,000 fine, I simply can’t imagine a better way to spend 5,000 Canadian dollars,” he said of the penalties. Despite the remarks – which included Oliver throwing around Canadian twenties -- Elections Canada says the comedian didn’t break any rules. The law covers inducing voters -- or offering them tangible goods -- in return for their votes. “A personal view is not inducement,” said Elections Canada spokesperson John Enright.